Today, I think I have found one of my new favorite cookies of all time, Mexican Chocolate Crinkle Cookies. This classic cookie with inspiration from Mexican flavors has all the things you need for a great cookie and more. Just like any great cookie, it has a chewy center and a slightly crunchy exterior. 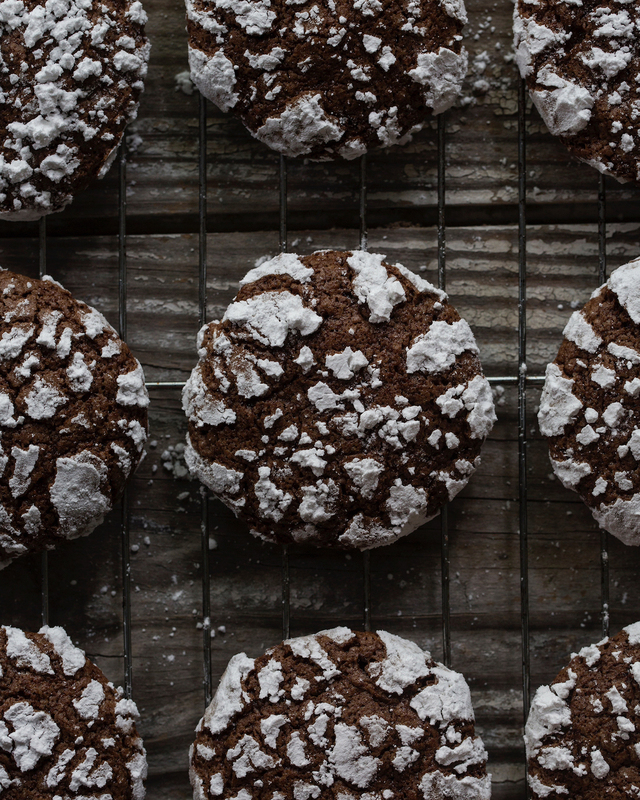 While it may look like your typical Chocolate Crinkle Cookie what makes this cookie unique is its flavor. This cookie has a deep chocolate flavor that pairs so well with the earthy cinnamon that I added, inspired by the hints of cinnamon in Mexican Chocolate. Finally, the cookie has hints of smokey and spicy notes from the chipotle power that makes for the perfect bite! I really love the flavor combination of chocolate with cinnamon and a little bit of chipotle powder. I encourage you to add cinnamon and chipotle powder into all your favorite chocolate desserts for a quicker flavor. Also, I hope you enjoy making and eating these cookies as much as I did. They are the perfect after school snack! In a large bowl beat together the oil, cocoa and sugar until fully combined. Add in the eggs and vanilla extract then mix until smooth. Add in the flour, baking powder, salt, cinnamon, chipotle pepper to the bowl then mix until fully incorporated. Pour the dough into an airtight container that has been sprayed with cooking spray. Refrigerate for least 2 hours or overnight. When ready to bake the cookies, preheat oven to 350 degrees fahrenheit. Wash, dry and spray hands with cooking spray. Take a tablespoon of dough out of the container with a sprayed measuring spoon and roll the dough in your hands to make a ball. Roll the dough ball in the powdered sugar until it is completely coated. Place the ball on a cookie sheet lined with parchment paper. Repeat the process, leaving 3 inches between the balls, until the tray is full of cookies. Bake at 350F for 12 minutes until the baked ball settles a little around the edges. For the perfect cookie the outside should be slightly firm and the inside should be soft so make sure not to over bake them. Your photos are gorgeous and the cookies look delish! Thank you so much! They are so delish!